I heard a new term recently – “Range Anxiety”. 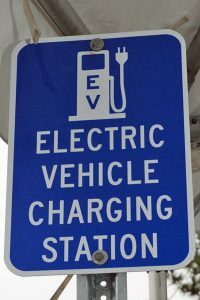 The feeling you get when your electric vehicle has 20 miles left but you’re 21 miles away from home. We’ve been tossing around the idea of getting an electric vehicle, but always bump up against that nagging feeling that we’ll need to carry an extra battery around “just in case”. Now I know that our nagging feeling has a name! 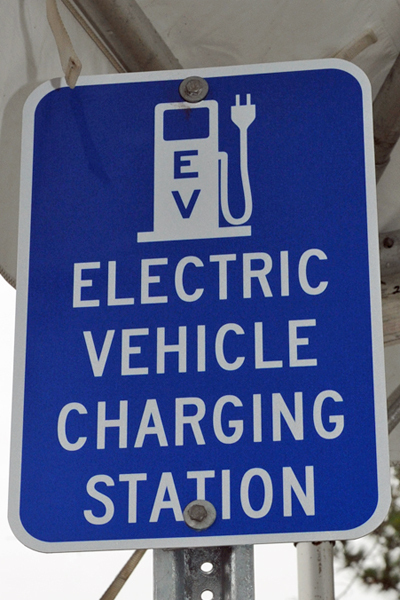 As more people get their own Electric Vehicle, more charging stations are being built. Even our little touristy town of 1100 people has a charging station for visitors. If I had an EV, I would keep this page bookmarked on my phone in addition to a list of friends and their phone numbers! I hope you found this information helpful. Let us know your thoughts in the comments below! Of course, we all have our favorite spots to “leaf peep”, but here are some websites with info on locations and timing, and some news as well. My favorite site is from Weather.com. This one shows a map of the US and when each region will be at its peak. The mountains in Colorado show late-September, but some of the lower elevations of Colorado show a peak of early to mid-October. I like this page from New England Today. It provides a good list of what you should bring with you. Besides the obligatory map and camera, there are other items that you’ll want to have as well. One thing it doesn’t mention that you should have is your good manners! Remember to pull all the way off of the roadway when you stop to take pictures. Not everyone on the road is on a leaf peeping vacation. Some of them are trying to get to work or appointments! This website from the Smoky Mountains gives some of the science behind the leaves color-changing. It also has some downloadable pages for coloring! 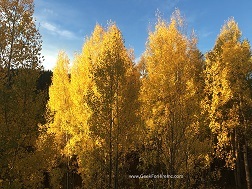 For those in Colorado, The Denver Post put together a list of hikes where you can also enjoy the changing aspens. And if you’re planning on heading out to the Maroon Bells, the Forest Service is gearing up for hordes of leaf-peepers! This page was a surprise. Apparently lots of folks take train rides through scenic areas to view the foliage. MSN has put together a list of 16 great places for leaf peeping throughout the US. This page is worth it for the photos alone! If you’re in the Eastern US, you’ll want to check out this page. The Boston Globe put together a list of the best New England towns for viewing the foliage. Was this list helpful? Please share it with your friends! Recently I saw an ad for something called a “rotating outlet”. What madness was this? 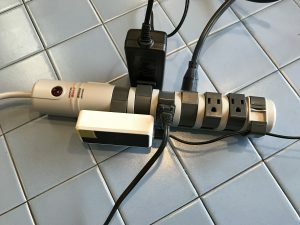 Something that allowed more than one ginormous plug to be plugged into one surge protecting strip at the same time? Amazing! I had to have one. But which was the best one? I purchased three of these Rotating Outlet Surge Protectors to check them out. Two are made by Belkin, and the third came from SurgExpert. Of course, when the box arrived, Chris mentioned that he had installed one in his office three years ago. I had just never seen it – or noticed its awesomeness. When I took them out of the box, I noticed that two of them were virtually identical, right down to the cable management clip to keep the cords out of the way. To test them, I used the same big plugs; one from a router and one that charges multiple USB devices at the same time. 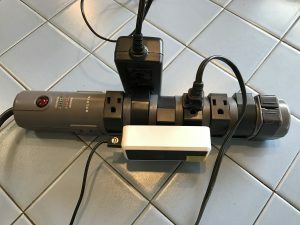 On the two power strips, they easily fit side by side, rotated to opposite sides. With the wall outlet, I had to put one on either side. It didn’t allow enough rotation to put them next to each other. I paid $16 for the wall rotating outlet and it comes with a $50,000 “Connected Equipment Warranty” as described above. This one was easy to install, and, for a wall outlet, I think it works pretty well. And in the past few days, I’ve thought of other places that needs this as well. 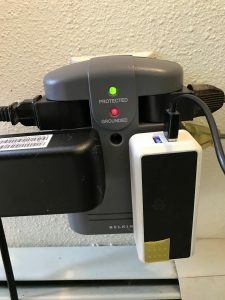 This Rotating Outlet was also $27, but doesn’t have the phone line protection, and also doesn’t have a “Connected Equipment Warranty”. 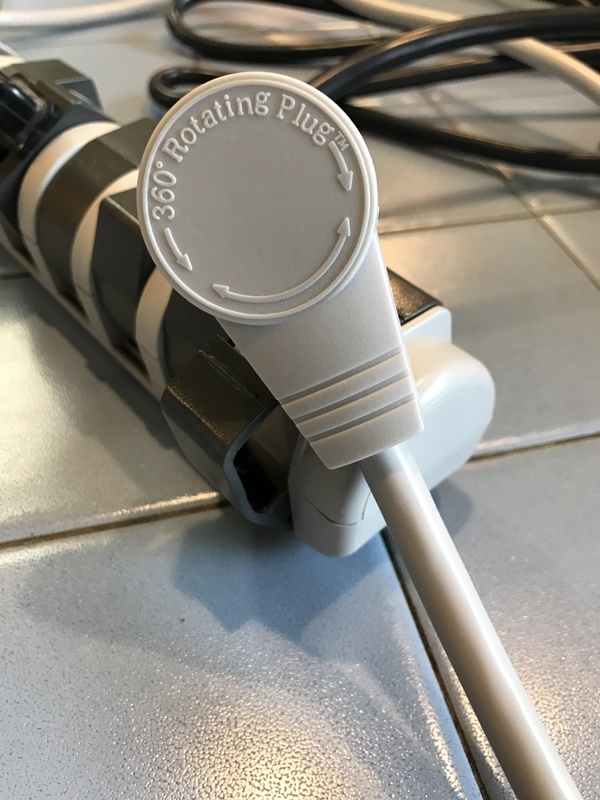 But it does have a rotating plug which gives you more flexibility when plugging it in. Like the Belkin above, which it is virtually identical to, it also has a cord maintenance clip to help keep your cords organized. In the end, I liked the SurgExpert the best. It had a more neutral color, and I really like the rotating plug. The Belkin is a better value though, as it comes with the ability to protect a phone line, as well as the warranty. I will also be purchasing another of the Belkin wall outlets. 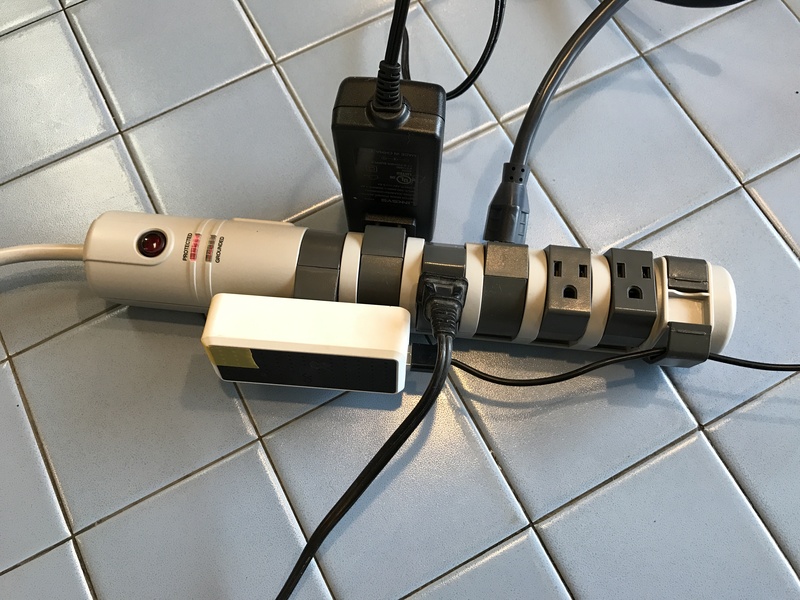 There are places where you don’t need an 8′ extension cord and do want all of your plugs to go to the same place. I can think of several places to install another one of those. I hope you found this review helpful. Let us know your thoughts in the comments below! Every once in awhile we get called to someone’s home about a problem that has been perplexing them. 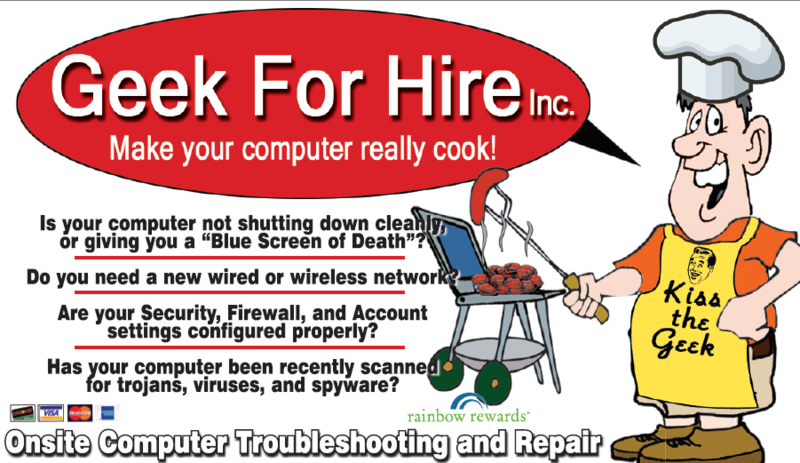 We get there and, for us, these are easy fixes, and we have the problem resolved within 15 minutes. Of course, I try to screen those calls when they come in and talk the caller through a potential solution, but it doesn’t always work out. Plus, sometimes people just want to have someone else take care of it for them! 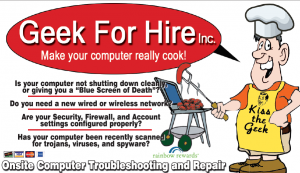 Vintage Geek For Hire – make your computer really cook! For the short term, you can plug a monitor into your laptop so that you can see what is on the screen. For the long term, you’ll need to decide if you want to replace the screen, or just get a new laptop. If that doesn’t work, make sure the little dongle you have plugged into one of your USB outlets is plugged in all the way. If that doesn’t work, change the batteries. If that doesn’t work, plug in a wired keyboard or mouse, or get a new one. The keyboard on my laptop isn’t working, or one of the keys doesn’t work. 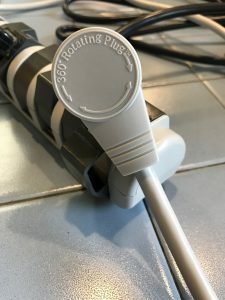 Does the charging cable sit firmly in the plug/outlet on your laptop? If it doesn’t, you might need to have the plug/outlet replaced on your laptop. You might also consider getting a new machine. If you always have the laptop plugged into the same outlet, check that the outlet still works. Plug a lamp in and see if it turns on. If it doesn’t, call your electrician. Are these Easy Fixes helpful for you? Please forward to a friend! Ars Technica – I think this is his most favorite site. C|Net – I like C|Net too. 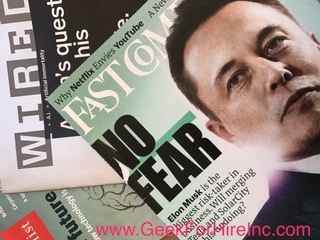 Wired – I can’t prove it, but we were one of Wired’s first subscribers to their print magazine! Fast Company – I like FastCo because they have some pretty engaging content. Huffington Post – Granted, these articles are “dumbed down” for the masses, but it does give me more of an idea of what people are worried about with their tech right now. Gizmodo – Lots of gadgets – it’s all about the gadgets. The Verge – Reviews of lots of trendy new tech toys. Check out these websites and let us know what you think. Do you have other favorites that we haven’t listed here? Let us know in the comments below. And, as always, If you found this helpful, please forward it!